Peru's President Pedro Pablo Kuczynski has quit over a vote-buying scandal. He has denied wrongdoing but said on Wednesday that he did not want to be an obstacle to the country's development. 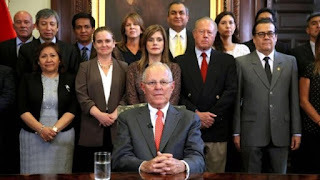 Party leaders in Congress later agreed to accept President Kuczynski's resignation. He had been facing an impeachment vote on Thursday. Pressure has been growing after footage emerged of his allies offering opposition politicians financial rewards if they backed him in the vote. Congress still has to vote on whether to accept President Kuczynski's resignation. Lawmakers will meet on Thursday to discuss the issue and are expected to put it to a vote later on Thursday or Friday. Even before the vote-buying allegations emerged, a majority of lawmakers had indicated that they would vote in favour of his impeachment on grounds of him allegedly being "morally unfit" to hold office. It is therefore hard to see how he could survive politically. In fact, members of Congress, especially his most bitter rivals, could still decide to plough ahead with the impeachment regardless of his offer to resign.